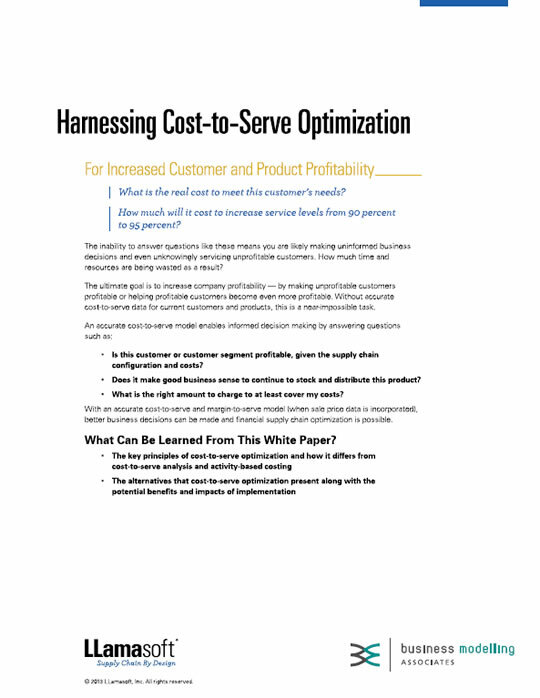 What is the real cost to meet this customer’s needs? How much will it cost to increase service levels from 90 percent to 95 percent? The inability to answer questions like these means you are likely making uninformed business decisions and even unknowingly servicing unprofitable customers. How much time and resources are being wasted as a result? Is this customer or customer segment profitable, given the supply chain configuration and costs? Does it make good business sense to continue to stock and distribute this product? What is the right amount to charge to at least cover my costs? With an accurate cost-to-serve and margin-to-serve model (when sale price data is incorporated), better business decisions can be made and financial supply chain optimization is possible.